January 19, 2017 prompt: In 99 words (no more, no less) write a about a quarry. It can be a place or include the by-product. The quarry can be operational, abandoned, it can be in real-tie or mentioned from another time. Where will the quarry take you? Go where the prompt leads. ‘Do you know who does all the work?’ He asked pointing a finger at the pickets. I’ve gone all the way back in time to Greek mythology for my inspiration this time. The myth of Sisyphus, the mortal King of Corinth who was punished by the Gods to carry the same rock up and down a hill for all eternity, has always fascinated me. 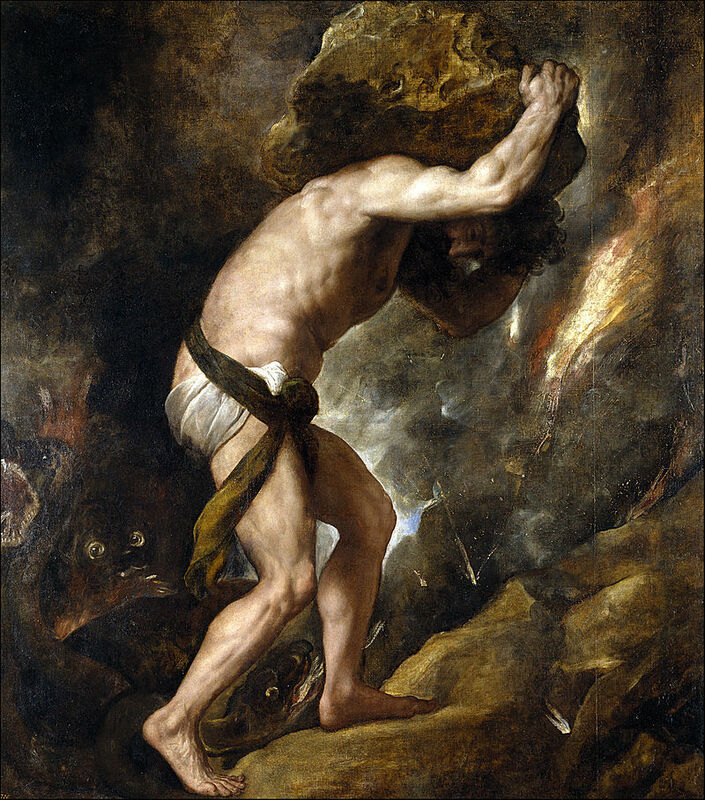 Sisyphus by Titian (1548-49) Prado Museum, Madrid, Spain. Then the great Albert Camus tried to convince me that Sisyphus was happy, because he had accepted his lot. Rebellion leads to unhappiness. Accept that life is harsh and absurd and you’ll be all right. A shocking suggestion for a nonconformist optimist like me, and yet the concept fascinates me because it’s what so many people do without questioning. Am I doing what I want to do? Is this the life I want for myself? If your answer is no, you need to answer so many more questions you may never find the answer to, such as what are the alternatives? How can I achieve them? What if I fail? Will I ever be happy or satisfied? Will I be worse off in the end if I don’t accept my lot? etc. According to Camus, questioning the harshness and absurdity of life will only lead to greater unhappiness. However, if your answer is yes, I’ll do as I’m told, your problem is solved. Just get on with pushing the rock up every time it goes down. Don’t think, don’t complain, just do it. Obey. I’ve discovered my own answer. I’m not following anyone’s rules. I’m terribly disobedient, disrespectful, and challenging. I’m not interested in doing what I’m told or even explicitly searching for happiness. I want to experience life as an ongoing process, a journey which ends in death, and may or may not continue on to other unknown destinations. And while I’m here, I can’t stop asking: what if? What if Sisyphus wasn’t punished at all? What if he craved glory? What if he needed to be praised and loves carrying the rocks up the hill? What if he loved showing off his muscles and his strength? What if others were envious of him and his fame? What if he got others to do his dirty work? Very interesting point of view. And love the story. Thanks! I do like your “What if questions” that arise from your rebellious, non-conformist, spirit. You have shown this through the alternative points of view in your novels. Poor Sisyphus. Or was he? Good question. I know many people, my mother included, who accepted their lot in life. Theirs was quiet acceptance and without rage against the dying of the day. I think seeking our own path, whatever that be, is the way to go. Or is it too, just acceptance? Have we created our own rocks to push? Sometimes I wonder. I like that question, Norah: Have we created our own rocks to push? Undoubtedly. But they’re my own rocks, not imposed by anyone else. And I do enjoy looking for rocks to push! Thanks for sharing your thoughts, Norah.💗 Always inspiring. That’s true. How dull would life be without a few rocks to push? Oh, Lucy I’m a fellow optimistic nonconformist! Happiness might indeed be found in carrying one’s lot in life up and down, but I find joy in meaning. Perhaps my own sense of purpose is made up, but it’s mine. If we are to carry rocks, why not choose which ones and where. Fantastic rewriting (and exploration) of myth. Yes! The black sheep stands out! I’ve always been fascinated with mythology and do love the story of Sisyphus. Interesting take on this myth and love the questioning… What if? I’d say it’s about fighting for being able to choose your battles/rocks rather than accepting all of them. I’ll check out your post! 💗 I feel a bit irreverent, messing up literary and legendary myths, but I always thought the black sheep was the most inspiring😂 I’ve always been fascinated with mythology and do love the story of Sisyphus.